Sunday December 29 1907 After a late breakfast Mr Brown sent a man to take me back to town. It was growing colder. I found [Vera?] getting dinner and the girls gone to church. It stormed all afternoon and we visited at home. [Laura? Lorna?] went away at 4.07 In the evening Dr Owens came to give Lydia her treatment. I was quite interested in it. What a good time I have had today. 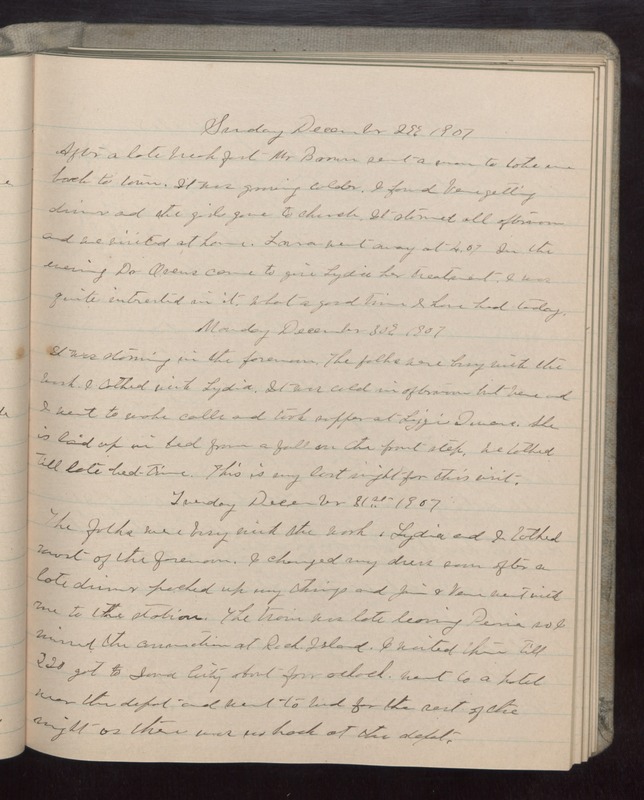 Monday December 30 1907 It was storming in the forenoon. The folks were busy with the work. I talked with Lycia. It was cold in afternoon but [Vera?] and I went to make calls and took supper at Lizzie Duncans. She is laid up in bed from a fall on the front step. We talked till late bed-time. This is my last night for this visit. Tuesday December 31st 1907 The folks wer busy with the work. Lydia and I talked most of the forenoon. I changed my dress soon after a late dinner packed up my things and Jim & [Vera?] went with me to the station. The train was late leaving Peoria so I missed the connection at [Rock?] Island. I waited there till 2.20 got to Iowa City about four oclock. Went to a hotel near the depot and went to bed for the rest of the night as there was no hack at the depot.